Bluefish Capital is an early stage venture capital firm investing in businesses in the data analytics and data services verticals. Bluefish Capital is led by Stephen Brodeur. Bluefish Capital invests in early stage companies in the data analytics and data services verticals where its unique market expertise can make a difference. Its approach is simple. Hello! I’m Stephen Brodeur … I founded Bluefish Capital in 2005 as way to channel my personal resources, including my time, influence and capital, towards opportunities and projects that stir my passion. Passion, for me, is always full-tilt and full-time. I’m a detail-oriented business leader that likes getting in the weeds of anything I do. I love collaborating with people who have a similar philosophy and who like to work hard and think hard. I believe that great ideas and great organizations are the outcome of effort and meaningful involvement. Those ingredients, among many others, are crucial to the process of accomplishment, and I love everything about it. I started my career, pre-Bluefish, by buying a boutique technology-focused strategy consulting firm, called Cambridge Strategic Management Group, and growing it into a much larger 100-person organization with offices in Boston and London and serving clients throughout the world. Our expertise and advisory work covered a gamut of disciplines, including corporate merger analysis, economic valuation, business diligence and product development, and we worked with clients such as Verizon, Siemens, Goldman Sachs, China Telecom and Apple. By the early 2000s, we were regarded as one of the most influential firms in the technology vertical. As its leader, I testified about the health of the sector before the US Congress’ Committee on Energy and Commerce; I served as a witness for the Department of Justice on several merger investigations; and I spoke before numerous industry conferences and associations. In 2002, I sold Cambridge Strategic Management Group to Cartesian (CRTN). Since this transaction, alumni of the firm have gone on to start other successful advisory groups, including Altman Vilandrie & Company and CMA Strategy Consulting. Bluefish Capital came along shortly after the sale of Cambridge. I had initially conceived of the firm as a way to become involved in investing opportunities alongside former consulting clients. But I quickly realized my passion lived elsewhere and, in 2009, pivoted Bluefish to focus on early stage investing. The data services space immediately sparked my attention. The most successful investment for Bluefish so far has been Comlinkdata, a firm for which I was the founder and CEO until it was sold to Alpine Investors in 2018. 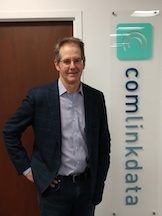 Comlinkdata, with 55 employees, provides real-time consumer behavior metrics and market flow share data to the North American telecommunication vertical, with its information reaching the C-suite of its client base every day. Currently, Bluefish is working on the development of two new companies, both following the Bluefish playbook of building customer solutions enabled by data -- one in 5G spectrum utilization and the other in programmatic advertising. My passion for involvement also extends to the non-profit world where I serve as Chairman of Plimoth Plantation, a museum which tells the iconic story of the 1620 voyage of the Mayflower, the settlement of Plymouth Colony and the Wampanoag people who help the Pilgrims survive. I work alongside a team of talented museum professionals who work hard and think hard about how to broaden the Museum’s philanthropic base, expand its programmatic relevancy and transform its business model. As the organization’s Chairman, I lead its on-going $20 million capital campaign, the centerpiece of which is the restoration of Mayflower. In May of 2020, we will celebrate the 400th anniversary of the Mayflower’s Atlantic crossing with a major public event in Boston which we expect will include former US Presidents, members of the British Royal family and a number of Massachusetts-based celebrities and public officials. I live in Boston with my wife, Andrea, my daughter, Olivia and an assortment of furry creatures. Our family passions include spending time together on Cape Cod, exploring its beaches, estuaries and wildlife. I’m an avid fisherman and outdoorsman, and you can find me many summer mornings heading out on the ocean to catch stripers, tuna and bluefish (of course!). Got Something to Talk About? Interested in joining one of our portfolio companies?